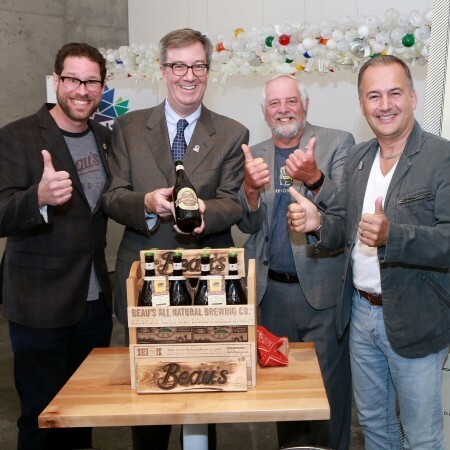 OTTAWA, ON – At a press conference held yesterday at Datsun Restaurant, Ottawa Mayor Jim Watson announced that Beau’s All Natural Brewing has been named the Official Beer Partner of Ottawa 2017, the year-long celebration of Canada’s 150th birthday taking place next year in the capital. The partnership will see Beau’s flagship Lug Tread Lagered Ale offered as the Official Beer at licensed Ottawa 2017 events, as well as a series of collaborative beers from Beau’s and other breweries across the country, including Ottawa’s Big Rig Brewery and Kichesippi Beer. Bottles of Lug Tread will soon feature a branded necktag for Ottawa 2017, just in time for the brewery’s 10th anniversary on July 1st.